From Lexi to Lydia, Brooke to In Gee, these gals can sure play. Before I start with this week's tournament, I want to give a big congratulations to Ariya Jutanugarn for winning the U.S. Women's Open. It sure looked like this one was going to be a snoozefest as Ariya jumped out to a seven stroke lead with nine holes to play. But this is the LPGA (yes I know it's a USGA event) and nothing is ever over until it is actually over. Ariya had a complete meltdown over the final nine holes and wound up in a playoff with the charging Hyo-Joo Kim. It was still tied after the 2 hole aggregate playoff, and then it was off to sudden-death. They parred the first sudden death hole (#14), and when Kim bogeyed the second it was all over. For Ariya, it was her tenth LPGA victory and second Major Championship. This week the LPGA moves to the state of New Jersey for the playing of the ShopRite Classic Presented by Acer. This tournament has a long history dating back to 1986 when it was then called the Atlantic City LPGA Classic. Winners of this tournament include: Annika Sorenstam (3 times), Stacy Lewis (twice), Karrie Webb, Ai Miyazato, Se Ri Pak and Cristie Kerr. It was won last year by In-Kyung Kim by 2 strokes over two time defending champion Anna Nordqvist. In-Kyung Kim will try to defend the ShopRite title she won in 2017. This will be tournament #15 of 33 on the 2018 LPGA schedule. This is a 54 hole event. My strength of field rating is 48% (down from 59%) last year. Twenty-seven of the top 50 players from the LPGA Priority List, and 21 of the top 50 players from the Rolex Rankings will be teeing it up. The field will be led by top ten ranked players: Shanshan Feng, Sung Hyun Park, I.K. Kim, Minjee Lee, and Jessica Korda. Top players skipping the event this week include: Inbee Park, Lexi Thompson, Ariya and Moriya Jutanugarn, So Yeon Ryu, Cristie Kerr, Michelle Wie, Danielle Kang, and Nelly Korda. For an explanation of how I compute my field ratings press here. The first round pairings have now been posted. 1- Shanshan Feng - Feng (#4 in Rolex Rankings) is the highest ranked player in the field this week. 2- Sung Hyun Park - Hasn't played well this year but is still ranked #5. 3- I.K. Kim - Defending champion is third highest ranked player in the field this week. 1- Anna Nordqvist - She has finished in the top three the last four years. 2- Megan Khang - Has three consecutive top 10 finishes. 3- Minjee Lee - Always a threat to win. 1- Emma Talley - Could surprise in this weak field. 2- Stacy Lewis - Not playing well but knows how to win here. 3- Marina Alex - New Jersey girl due to break through. The U.S. Women's Open was not kind to many of the LPGA stars. Those players failing to make the cut include: Sung Hyun Park, Shanshan Feng, Anna Nordqvist, Stacy Lewis, Amy Yang, Mirim Lee, and Jessica Korda. How dominant has Ariya Jutanugarn been this season? 1- She is the only multiple winner on tour this season. 2- She has seven top five finishes, no other player has more than four. 3- She has 10 top ten finishes, no other player has more than six. 4- She has earned $1,704,614 in official earnings this year. That is nearly double the amount of Inbee Park's $863,286 which is second place. 5- She has 150 player of the year points. That is nearly double Inbee Park's total of 79 which is second place. 6- She is leading the Race to the CME Globe by a huge amount (see below). 7- Her 1.717 putts per greens in regulations leads the tour. 8- Her scoring average of 69.558 is only topped by Jessica Korda's 69.485. Lindy Duncan carded an eight over par 13 on the 11th hole during Sunday's round. There were several major moves this week. Ariya Jutanugarn makes the most important move, jumping up from #5 to #2. Hyo-Joo Kim skyrockets from #67 to #33. 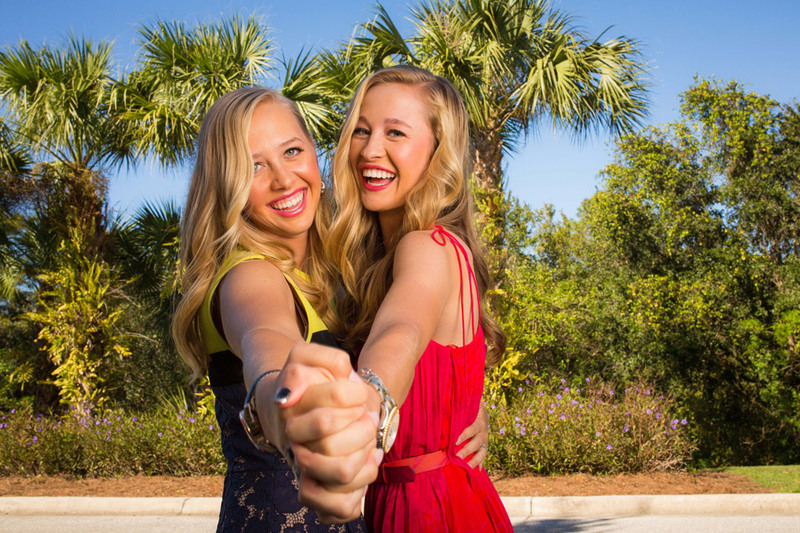 Nelly Korda jumps up from #46 to #38, while Wei-Ling Hsu moves from #74 to #60. Sarah Jane Smith catapults from #97 to #77, while Madelene Sagstrom rises from #86 to #78. Ariya Jutanugarn increases her lead with 2,450 points. 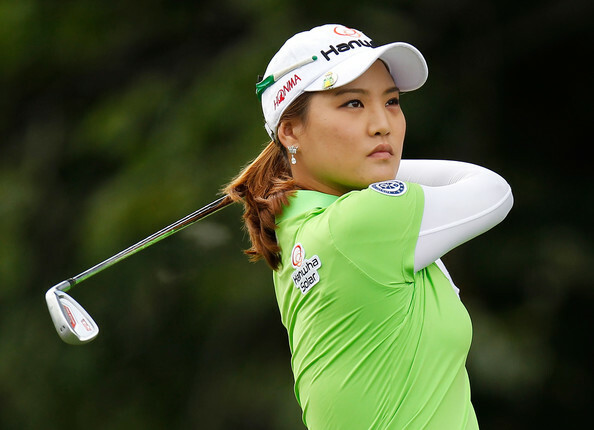 She is followed by her sister Moriya Jutanugarn with 1,600 and Inbee Park with 1,598. Minjee Lee (1,509) and Jin Young Ko (1,286) round out the top five. Have I mentioned Ariya Jutanugarn? Nasa Hataoka has four consecutive top ten and six consecutive top twenty finishes. Mirim Lee has not seen the weekend in her last four tournaments, nor has Amy Yang in her last three. M.J. Hur has not finished in the top 50 in her last six starts, with three missed cuts. Three of those tournaments have been won by players from Thailand. 1- What two players hold the course record of -17 under par? 2- What player won this tournament by the largest margin of victory? For the answer to this week's trivia question press here. I will be attending this tournament. Check back here later in the week for a photo gallery. 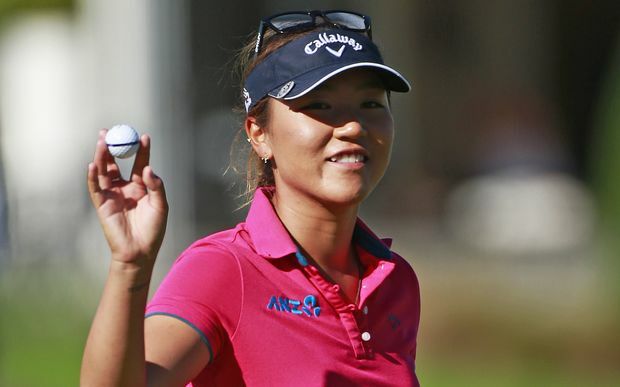 Be sure to check back here daily for any LPGA news or updates. They will be posted here at the bottom of this blog. Tournament results will be posted here at the end of each round. Links to all Women's Tour scoreboards can be found on the right side of this page (or on pull down menu on mobile website). Resides: Lake, Las Vegas, Nev.
Natalie has had many of her best finishes in Major Championships! ANA Inspiration - Finished 3rd in 2006KPMG Women's PGA Championship - Finished 5th in 2005U.S. Women's Open - Finished 4th in 2005Ricoh British Open - Finished 9th in 2013The Evian Championship - Finished 52nd in 2013 (It was not a Major Championship when she won this event). 329 career starts238 cuts made (72.3%)37 top tens (11.2%)Has $4,898,508 in career earnings through the 2018 season (67th on the all time LPGA career money list). The LPGA had its first reshuffle of its Priority List this week. While most of the players moved up or down a few insignificant spots, there were some very significant moves also. The Priority List is what is used to fill the required amount of spots for any given tournament. Without me getting into the categories, which is potentially confusing, here is a brief explanation. Most full field events have a field of 144 players. Usually 140 of the players come from the Priority List ranking. Two players are Monday qualifiers, and 2 more are sponsor exemptions. So to keep it simple, if your Priority Rating is #150, you have to hope that 10 players decide not to play, or you are probably not getting into the field. The final stage of the LPGA qualifying tournament, the Q-Series, will begin this week. A field of 102 players will be teeing it up. At the 2017 CME Group Tour Championship, the LPGA first announced that Q-Series will replace LPGA Qualifying School Final Stage, which was previously held annually in Daytona Beach, Florida. Instead of 90 holes like the old Final Stage, the new Q-Series will be 144 holes. Players will compete in two, four-day tournaments with cumulative scores over the eight rounds for a $150,000 purse, which will be distributed at the end of the eight rounds. The LPGA will debut the new Q-Series at the historic Pinehurst Resort in Pinehurst, North Carolina, which has hosted several prestigious tournaments including the 2014 U.S. Women’s Open. 1/24/19 Bonus photos added at bottom of page. As many of my readers know, my wife and I go to quite a few LPGA tournaments each year. Since 2009 we have gone to almost 60 events, including two in Scotland (St. Andrews being our favorite), and 8 Canadian Opens. I do all the writing on here, and my wife (who is a schoolteacher) is my proofreader and takes many of the photos. Neither of us are professional photographers, but once in a while we get lucky and capture a moment that is very popular with my viewers. Below I have reposted the most popular photos of 2018. I based this on the number of website hits, and the number of comments each photo received. Some came as quite a surprise to me, as when they were taken I was not expecting such a reaction. With the LPGA taking a two week break before resuming its schedule in the United States, I thought it would be a good time to do my third LPGA player profile. The player I have chosen this time around, may not be a household name like the first two were, but I have received a number of requests to do this profile. Before I get started on this week's tournament, let me give a big congratulations to Minjee Lee for winning the LPGA Volvik Championship. Minjee's final round -4 under par 68, was good enough to win by one stroke over runner-up In Kyung Kim. This week the LPGA travels to the state of Alabama for the playing of the U.S. Women's Open Conducted by the USGA. This is the second Major Championship of the 2018 season. 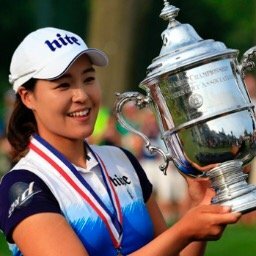 Sung Hyun Park will be trying to successfully defend the title she won last year at Trump National Golf Club by two strokes over Hye Jin Choi. This will be tournament #14 of 33 on this year's LPGA schedule. It is also the 2nd of five Major Championships to be held this year. Michelle Wie announced on Instagram last night that she is engaged to marry Jonnie West, the Golden State Warriors' director of basketball operations. Jonnie is the son of NBA Hall of Famer Jerry West. Wie, 29, a Punahou School and Stanford graduate, is a five-time winner on the LPGA Tour. West, 30, played basketball at West Virginia, his father’s alma mater. Wie, who has been recovering from hand surgery in October, is expected to play in the Lotte Championship, April 17-20, at Ko Olina. Who was the only LPGA player to play in 30 events in 2018? For the answer tothis week's trivia question press here.